﻿ France - Provence - Bike tour in the hilltop villages of Luberon. France - Provence - Bike tour in the hilltop villages of Luberon. Self-guided cycling holiday in Provence, France. We reserve the bikes, the rooms, the dinners, luggage transfers from hotel to hotel, and provide the road book and the maps. Riding on small, quiet picturesque roads the rolling terrain of this bike trip in Provence is accessible to everyone, to all levels. You will discover the Luberon and its Natural Regional Park as you ride through stone villages and contemplate the architectural beauty and the anecdotes that make up rural living. Your rides follow a signposted itinerary at each junction, which allowis you to keep your eyes open (instead of reading a map at every stop) and discover a beautiful area. Outstanding natural beauty and Art de vivre under a warm Provencal climate with a special light so specific to Provence. RDV in the early afternoon in Cavaillon, a town at the foot of the Luberon is a perfect spot to start your week in Provence. This first ride to Lauris is via Cheval-Blanc, Mérindol, with its Vaudois history arriving at the perched village of Lauris that overlooks the Durance River valley. Dinner and night. The Chateaux du Luberon day in the southern Luberon. From Lauris to Vitrolles-en-Luberon (or Grambois). 30 km, +280m. Riding small shaded quiet roads you will ride from village to village. Each village is different but often they share the simplicity that is Provence with their Plane tree lined squares with fountains that sing in the heat of the day. Some of the villages are very well known as they were part of such movies as "Manon des Sources" or "Le hussard sur le toit" : Vaugines, Cucuron, Cabrières d'Aigues. Dinner and night. Le Pays d’Aygues. From Vitrolles-en-Luberon (or Grambois) to Manosque. 35 km, +300m. In the heart of Haute-Provence with its large open spaces, mountains and hills are dotted with Lavender fields or different cereal crops, herds of sheep, forests...some with views towards the Alps and others overlooking the Durance Valley. You will discover the villages of La Bastide des Jourdans, Beaumont de Pertuis, Pierrevert. Night in Manosque. Au pays de Giono. From Manosque to Forcalquier. 25 km, +300m. Today's ride can also be called the Lavender road. It is difficult to imagine the area around Forcalquier, in the heart of summer, without the infinite shades of blue that sway on the horizon and the subtle perfume-like scents that evoke La Provence, like a summer morning with its small streets that climb up to a village's church... Villages of Volx, Villeneuve and night in Forcalquier. 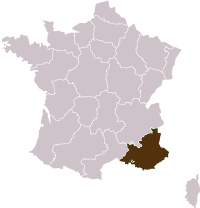 Au pays des comtes de Forcalquier. From Forcalquier to Céreste. 38Km, +450 m.
Passing through the small little-known villages of Saint-Maime or Dauphin, without forgetting St Michel l'Observatoire, a small town that talks to the stars with its observatory. After a small detour, discover a magnificent panorama in Vachères, the highest point to the week at 707m. The town's museum is also worth the detour with its Guerrier de Vachères and le Bachitherium. Afternoon descent into Reillanne before discovering the Prieuré de Carluc, a stop off point of the via Domitia. Dinner and night in Céreste. Céreste to Apt via Rustrel. Le Colorado Provençal. 36 km, +180 m.
Today's ride heads to Apt via the ochre quarry of Rustrel, Le Colorado Provençal. Discover the historic centre of Apt where you have the Luberon Park's headquarters (exhibits of the area's rich history and a museum). Night in Apt. Apt to Cavaillon. The Luberon's most famous hilltop villages. 38 km, +250 m.
The history and beauty is different for each village but all share the wealth that is the Luberon and Provence. From Bonnieux and its 86 steps rise up to the town's "vieille église" to Lacoste and the ruins of the Marquis de Sade's chateau today relive and are inhabited by another Marquis, Pierre Cardin. Onto Ménerbes perched along the top of a ridge that overlooks its Côtes du Luberon vineyards below. Return to Cavaillon where your trip ends after today's ride. 785 € per person for a 6 night trip. Single room supplement : +150 euros. 2 star hotels and bed & breakfasts. A road book with the description of your program and full detailed rides with a map. The trip to Avignon. All lunches and dinner Day 6 in Apt. Travel insurance. Last minute handling fee of 15 euros (reservation less than 90 days before departure). A road book with a map. The Luberon, and the heart of Provence ! Easy to follow quiet roads. The villages of Bonnieux and Lacoste.